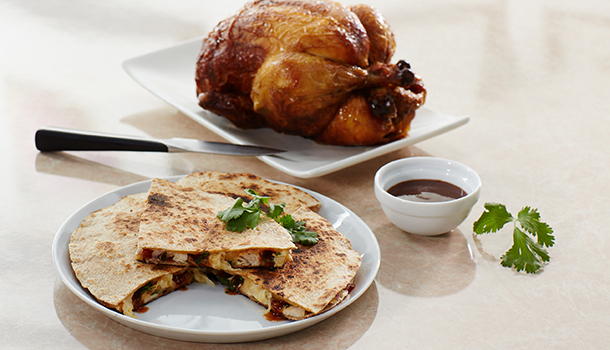 A chicken quesadilla is a great way to use up the remnants of a purchased rotisserie chicken or leftovers from last night’s chicken dinner. Tossing the meat in barbecue sauce creates a fusion of two cuisines, giving a classic an unexpected twist. In the mood for something more traditional? No problem. Skip the barbecue sauce and serve with salsa. In a bowl, combine chicken and barbecue sauce. Lightly coat a skillet with nonstick cooking spray. Place 1 tortilla in the skillet and sprinkle with cheese, chicken, cilantro, and onion. Top with the remaining tortilla. Cook over medium heat until the bottom tortilla is golden and cheese begins to melt. Flip and cook until the bottom tortilla is golden and cheese melts.